Sometimes you find yourself looking at a piece of art and marveling at the sheer amount of work it must have taken to craft such a result. 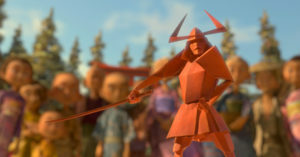 Kubo and the Two Strings is a film by the Laika stop-motion animation studio. It’s a boy on a journey with a monkey and a beetle. Kind of. It’s a boy with a talent for a special kind of magic who is on the run from the, ah, unfriendly parts of his family. Kind of. It’s a boy who follows the expected narrative for the situation he’s in… until he doesn’t, and his solution is perfect. Totally. Mostly because it’s so pretty. I mean, jaw-droppingly gorgeous. How can I turn away from a beautiful work of art that happens to also be witty and full of heart? I keep finding myself so impressed with the visual ideas on display that I forget to be impressed that this is all done with stop-motion techniques. Laika should be proud of Kubo. It’s a supreme work of art, regardless of how well the story connects with viewers. They turned intricate origami pieces into action elements. I can’t even imagine how much work that took. There are some odd and some vague elements to the story. One gets the feeling that the writers sort of threw more ideas at the movie than it actually needed. This fight is one of the moments when the stop-motion nature of the work is most apparent. One character in the movie is called Beetle and the end-credits song is a rendition of “While My Guitar Gently Weeps.” I see what you did there, movie. If you’re thinking, “You don’t really have much to say about Kubo, do you?” I can’t blame you. It’s not that kind of movie, at least not to me. It occupies a similar space in my mind to something like Voices of a Distant Star or Aria, where it’s more about the overall effect and the level of art quality than it is about any complexity in the plotline or anything like that. Go into it expecting a feast for the eyes with a side order of drama and laughter. Your expectations should be well-calibrated, that way.